Cliche Hosting Review 2019: Is Cliche Hosting a Good Hosting? Danish company Cliche offers simple, low-cost hosting and domain registration services best suited to newbies and casual web users. Look elsewhere for enterprise-level hosting with premium support. Cliche Hosting (or simply Cliche) was founded in 2002 in Köge, Denmark, and has since grown to have offices in Sweden, Norway, the U.K., and Germany. Cliche’s chief focus is on providing cheap, simple web hosting services and domain registration for private individuals looking to launch a website or a blog for the first time. Anyone looking for significant storage space, exceptional features, and premium support might want to look elsewhere. Cliche’s website is available in English, Danish, German, Norwegian, and Swedish. While Cliche isn’t the most feature-packed hosting service out there, it does provide a few perks. The WordPress auto-installer is excellent for beginners with basic skills and those who don’t want to get their hands dirty with manual configurations. It’s also packed with a rich suite of themes and plugins to create a stellar blog or website. Other supported CMS software includes Joomla, Drupal, PrestaShop, Concrete5, phpBB, TYPO3, XOOPS, and Coppermine. You are allowed only one website, but you can have as many domains and subdomains as you like. Cliche makes it easy to check the availability of your preferred domain, and it offers a wide range of popular domains (but only some of them for free). Cliche’s servers are located in a Danish data center that is fully managed and monitored by technicians 24 hours a day. 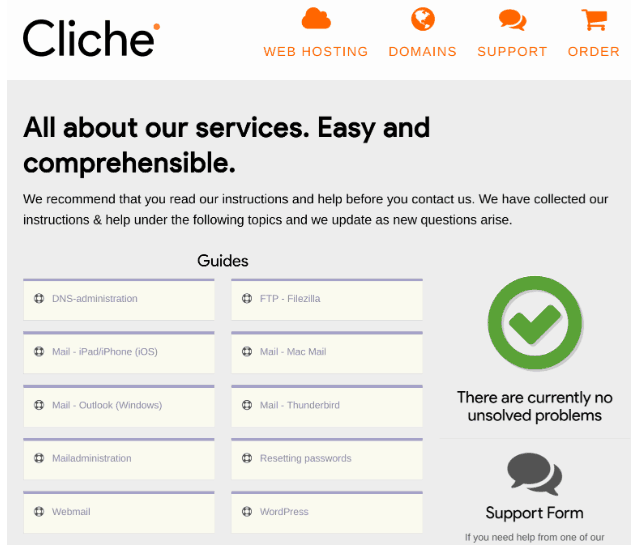 A status page on Cliche’s website tells you the operational status of its connectivity, support, control panel, DNS, web, FTP, mail, database, payments, and webmail services. Cliche offers five web hosting packages with disk space varying from 100 MB (with the Alfa package) up to 20 GB (with the Zeta package), and all plans except the entry-level Alfa plan come with PHP, MySQL, and SSL/HTTPS. You have to pay an initial setup fee, but you can upgrade or downgrade at no additional cost. You have to pay for plans annually by credit/debit card, but you get 14 days to change your mind if you think you made a mistake. You also get one to four months free, depending on the plan you pick. Contacting Cliche isn’t easy. The company encourages to fill out an online form that requires you to enter your customer number and pin code. Unfortunately, I received no reply when I tried the direct email channel instead. I can only assume that signed-up customers get better support, but there is also a self-support section containing guides and FAQs. There are few features apart from CMS support, and the resources allocations are not the highest, but for cheap hosting in Northern Europe, you probably can’t get better than cliche. Just don’t count on easily contacting this company. Just click-and-go with Cliche’s hosting. Wondering how Cliche Hosting stacks up against other Web Hosting companies? Enter any other Web Hosting company and we will give you a side-by-side comparison.